On-line entries are now closed. Start list can be found on www.fabian4.co.uk . Limited entry on the day will be available, subject to availability of maps and start times (this is especially relevant on some courses which are almost full). All events will use the Sport Ident timing system with contactless punching enabled. 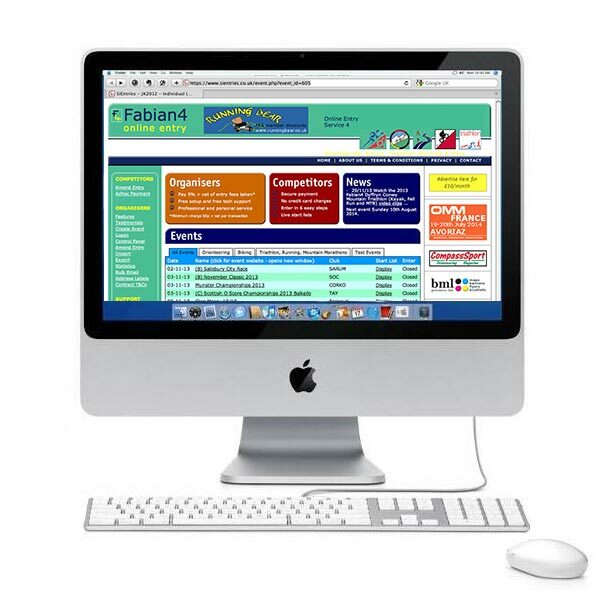 You pay for your entries on the fabian4 system using a credit or debit card. Contact if you need any help with your entry. Enter by age class. If you want to run in a different class on some days you have to create separate profiles in "Step 2" of the online entry process. One profile for each class you wish to enter. You can run up to any other age class that you choose. Note that you will only be eligible for a prize in the age class that you entered and not for any other class running the same course. If you are a Full time student entering at Junior rates, please indicate where and what you are studying in the "Special Request" box in "Step 3" of the online entry process. Start times will be in blocks. The 3 hour start period will be divided into 5 blocks and every competitor will have a start time in a different block each day. All members of a club will use the same start blocks, but you can choose to start with a club other than your own. There will be limited flexibility for exceptions to this system. Split starts will be available for couples supervising very young children. Both runners will have Open Starts. Colour coded courses are also available for pre-entry. All colour coded entrants will have Open Starts. These courses are of a lower technical standard than the senior age classes, from White (very easy) to Light Green (medium technical difficulty). There will be no prizes or awards for these classes. The entry fees per day are £6 for seniors and £3 for juniors/students both for pre-entry and entry-on-the-day. The event will use the SportIdent timing system. Contactless punching will be enabled for use with SIAC cards. Both standard SI-cards and SIAC cards will be available for hire when entering on-line. Standard hired cards will be charged at £1 per day for Seniors and 50p per day for Juniors. SIAC cards will be charged at £2.50 per day for both seniors and juniors. ​Note that SIAC cards will only be available for hire if ordered on-line with your entry. Only standard cards will be available for hire at the event. There will be a charge of £30 if you lose a standard hired card and £60 if you lose a hired SIAC. Please complete the boxes at the end of the entry form if relevant to your entry. It will be useful to the organisers to have an indication of expected numbers on the String Courses. There is an opportunity for you to make a voluntary donation to the Orienteering Foundation with your entry. The Orienteering Foundation is a registered charity, independent of British Orienteering. It was set up with money from a bequest from Bertie & Elsie Ward, and is now raising further funds, and awarding grants. The objectives are to promote the sport of orienteering in the UK through enhancement, innovation, and alleviation of hardship. Many grants have been made, for example supporting national teams at the World Schools Championships, regional squads training at home and abroad, and enhancing the Junior Home Internationals. There has been a historical focus on juniors, but they welcome grant applications for any UK projects that meet their objectives. Until July 13th for entries made on-line through Fabian4 using a credit or debit card, you will receive a credit on your card minus a refund administration fee in accordance with the Fabian4 T&Cs. e-mail to request cancellation. From July 14th to July 22nd Use the same procedure (as above) to request a 50% refund. From July 23rd Refunds for cancellation to recognise exceptional circumstances will be at the discretion of the Event Director and such requests should be made to . Until July 13th you can alter your entry details using the competitor Amend Entry function on Fabian4. From July 14th to July 22nd Class changes will be charged at £5 per competitor. Please pay the relevant fee via the Fabian4 Adhoc Payment feature and state the required change in the reason for payment box. From July 23rd changes will be dealt with at Enquiries at the events, with appropriate fees. Entry on the Day will be available for all courses (age class and colour coded) while maps and start slots are available. The fee will be the same as the highest pre-entry fee. Assuming entries are available; it will be possible to enter any or all of the 5 days at Event Registration on Saturday, or at Enquiries on Day 1. You can enter this at the same time as you enter the 5 Day event. Choose your start time; early, middle or late when you enter. The entry fee is £8 for seniors and £4 for juniors/students. We are providing a wide choice of event clothing, including a technical top, college hoodies, polo shirts and T-shirts. You can order these with your race entry at www.fabian4.co.uk. Orders for merchandise will close on June 20th. Details are available on the Merchandise page. There will be limited stock available for purchase at the event, so you are advised to pre-order your items. All proceeds from the sale of merchandise will go to support the North West Junior Squad. The organisers reserve the right to retain all or partial fees if the event is curtailed or cancelled.